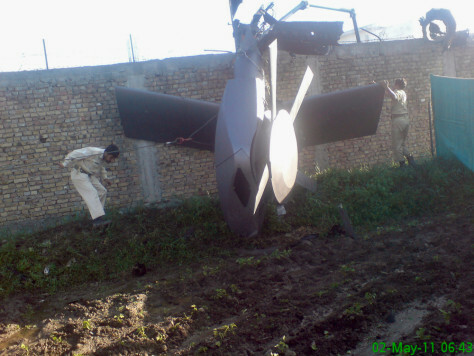 Secret, stealth chopper in compound wreckage? Part of a damaged helicopter is seen lying near Osama bin Laden's compound on Monday, a day after U.S. Navy SEAL commandos killed the al-Qaida leader. Bin Laden was killed in the U.S. special forces assault on the Abbottabad, Pakistan compound, then quickly buried at sea, in a dramatic end to the long manhunt for the man who had been the guiding star of global terrorism.